The first 1,800-tonne tunnel boring machine has arrived at Wilton International on Teesside. It will be used to build a 23 mile tunnel from Teesside to Whitby. The tunnel will be capable of transporting up to 20 million tonnes of polyhalite, a naturally occurring multi-nutrient crop fertiliser, which will be mined near Whitby. An underground conveyor belt will connect the new multi-billion pound mine to a purpose built shipping facility in Redcar. From there, the fertiliser will be shipped all around the world. The main parts of the 225-metre-long tunnelling machine arrived at AV Dawson’s Heavy Lift Port on the Teesside Docks on Friday 17, February, after a seven-day journey across road, river and sea, from a specialist factory in western Germany. 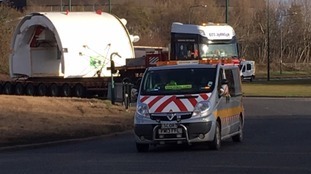 It was then transported through Middlesbrough on Saturday 16, February to the Sirius Minerals Construction site at Wilton International, where the machine is to be reassembled. Four hundred workers have been recruited to excavate the tunnel, with three quarters of them coming from the local area. The machine will bore the first of three separate tunnel drives which will make up the 23 mile tunnel from the mine, near Whitby, to where the fertiliser will be processed on Teesside. Each tunnelling machine will operate 24 hours a day, 7 days a week, lining the tunnel with concrete segments as they go.